Niagara Falls are a group of big waterfalls located in the Niagara River, that is between New York (USA) and Ontario (Canada). Niagara means "thunder of water" in the Iroquois language. The ancient inhabitants of this land were the Ongiara, a very peaceable tribe that was intermediary between the French conquerors and other tribes. 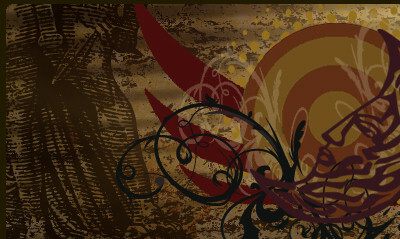 It is though that the first European that came to these lands was Samuel De Champlain in 1604. In the XIX century, this area became very popular. In addition of being a very important tourist destination, is also a very valuable source of hydraulic resources. There are several bridges that make easy to access to the waterfall's facilities. The zone of the south of Ontario maybe the most touristic area, and was a very popular destination for honeymoons during decades. They are surrounded by big parks with gardens, numerous hotels, casinos, and touristic attractions, like a big Ferris wheel that offers a great view of Niagara Falls both at day and at night. 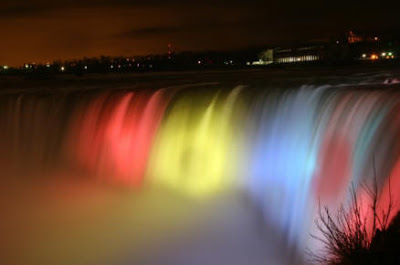 The waterfalls are lighted at night. As an additional entertainment, there are many comedy clubs, cafes and restaurants. One of the most stunning falls is Horseshoe Falls. It can be accessed through a tunnel that goes across the rock and ends in a balcony, offering a view of the waterfall from inside. In the American zone, there's an spectacular cavern, the Cave of Winds. There are also boat tours that take you close to the falls. The origin of Niagara Falls was the end of a glaciation that happened 10,000 years ago. The strength of the melt water acted like a natural digger, demolishing everything on its way, making the river's canals deeper. Great efforts have been done to control the erosion caused by the waterfalls so they don't end disappearing. In 1969, the Niagara River was diverted during months, to take measurements against this problem. Niagara Falls have supposed a challenge for many people. 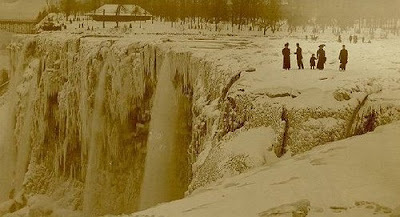 In 1829, Sam Patch was the first in jumping over the Canadian waterfalls and staying alive. Many others tried it after him. 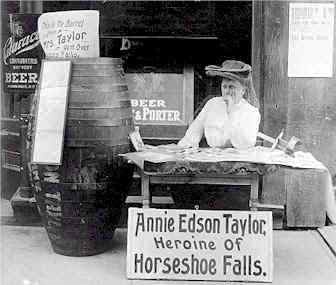 In 1901, Annie Edson Taylor was the first person to go over the Falls in a barrel. When she exited the barrel, she said "No one should ever try that again". But others tried, ignoring Annie's words. 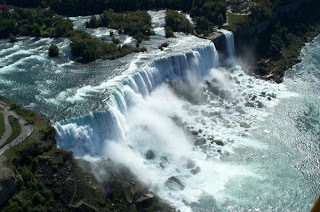 There are many stories and anecdotes around Niagara Falls, one of the most famous and important waterfalls in the world. Very Cool! I love the pic of the Frozen Falls. 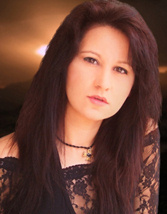 Emma, I live 2 hours away and had done my undergraduate work at SUNY College at Buffalo, NY. So going to the Falls was only a hop, skip, and jump away. 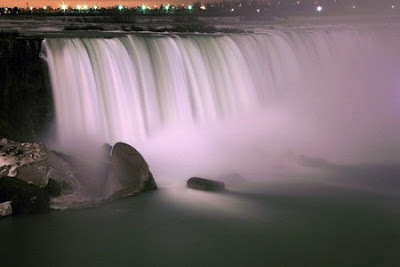 Of course, the Falls and sights are best seen from the Canadian Side, not American. I have many fond memories of Buffalo and Niagra Falls! :!